Condensation affects millions of homes in the UK, and is common in houses that are poorly heated and insulated; it usually gets worse in the winter. Condensation can lead to damp and mould growth damaging wallpaper, wall surfaces, window frames, furniture and clothing. The tiny spores produced by moulds can increase the risk of illness such as Asthma and Bronchitis. Condensation occurs when air carrying vapour comes into contact with a cool surface. At this cool point the vapour can hold less water and it deposits it onto the cold surface. The most vulnerable areas are where a large amount of moisture is produced, ie.­Bathrooms/­Kitchens or on cold surfaces such as windows in other rooms where this moisture can travel. Often you can see the droplets of water, but the droplets can also soak into the wall causing the wall to become damp and you will not see this until black mould and damp patches appear. 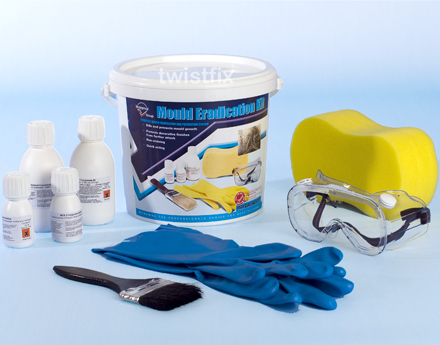 Twistfix with the help of industry experts have put together several kits and products to reduce/­eliminate the problems of damp and condensation. The loft unit comes complete with a fan filter and pre-heater; it gently ventilates the whole home when sited on a landing at the nearest point above the stairway. It has a very low running cost and is maintenance free. The home ventilation unit offers much improved Air quality. A heat recovery ventilator and condensation control unit. The ventilator provides a continuous air change with minimum heat loss; the unit recovers up to 86% of the heat contained in the outgoing air to warm the fresh incoming air through the heat exchanger. This comes complete with a tamper proof screwdriver. A black mould removal and prevention kit containing everything you need to kill damp black mould on walls. A mould removal system put together by industry experts.